Now that our full week of matinees are over - have a chance to answer yours of Dec. 21st. Was surprised to note the smog was as far out as Hollywood now - that's awful, but of course it won't cause the Producers eyes to water, they've been crying for Bloody years!! Happy to hear re "Pagan" picture & hope you get a decent run out of it - should do - Rome wasn't built in a day! Hope you had a nice Xmas - ours was quiet, but enjoyed it - Eda had letters from Helen - & happy Mark is much improved. Thanks for calling them Booth - know they appreciate it. Not much news - show going well & Bus. good - have sent you the Stage & Performer every week - ordinary mail - so you should now be getting them regular. All for now Booth - Eda joins in love & every good wish for '54. Thanks yours 4th.inst. First - want to let you know, some of our playing dates have been changed. We will now be at the Empire Chiswick, JAN 28th & EMPIRE FINSBURY PARK - FEB. 1st. I too had a letter from Harry Tozer - he hasn't been well for 2 or 3 years now - he should quit that Alaska job, it's too hard work for him at his age & the conditions are terrible up there - am sure he could find something easier and live like a human being. Hope to see you in town - in the meantime, every good wish for a Happy and Prosperous '54. Good health & good luck. Thanks yours 1st.inst. with your kind wishes for '54. Hope you had a good time at Geo. Fisher's Party - I just met him once - seemed a nice guy. 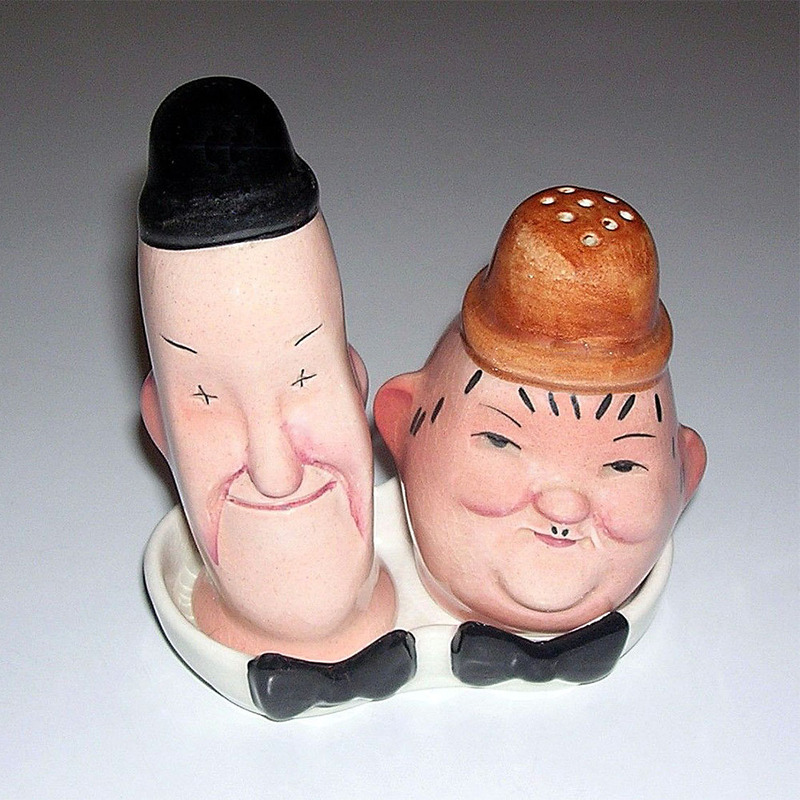 Interesting to hear re the L&H salt & pepper shakers - were they made IN CHINA or OF CHINE? The ones I have seen are made in England here, so was wondering if they had been copied. And you got the Xmas card with the personal touch! The above picture was taken the last time I was over here, visiting my sister's Pub - out front - is Lucille - Babe - Beatrice & Eda - I was going to be in the next picture, but the car on the right ran over me just after I took this!! Yes, I remember the picture you mention seeing at the club - selling Xmas cards - Charlie Middleton was in it too. I still have the script of it - have thought several times of rewriting it for a Stage Sketch - I think it could be made very funny. Strange thing, just had a letter from Ben Shipman - Hal Roach Sr. called him & is very anxious to make a deal with us for 40. TV. shorts to start releasing next Sept. - wants us to make some over here & the balance in Hollywood. He also offers me full charge of Production, so we will think it over. Weather here has turned warmer - now & ice dept. gone. Thank goodness. All for now Booth - Eda joins in love & best. George Fisher (1909-1987) was a Hollywood gossip columnist and radio personality who worked for the Los Angeles Evening News. He had columns in the movie magazines Modern Screen and Radio Mirror and has a star memorializing his radio career on the Hollywood Walk of Fame. Stan’s sister Olga Healey ran The Bull Inn in Bottesford, England. Laurel and Hardy stayed at the pub in 1952 when the pair performed at The Empire Theatre in Nottingham. Just to wish you a happy & successful week here. We are leaving for Portsmouth next. Then in Town for two weeks - Chiswick & Finsbury. Hope to see you somewhere soon. All join in love & best to Pauline & self. P.S. I have a new gag in the act - I ask for a cigarette!!! Our new sketch turned out quite successful. It was recorded on tape during our opening week. Think you will get a kick out of it when I get back to run it for you. Sorry delay in thanking you for your sweet Xmas Card & message. Just finished a 4 weeks run in Nottingham which included a block of matinees - so this is the first chance I've had. Hope you had a nice Xmas. We spent the day with my Sister. She has a small Hotel & Pub near Nottingham - which was an old church back in the days of Oliver Cromwell - I felt like a bloody Ghost walking around there! Show Bus. not too good in general here. They are all blaming the invasion of TV, which I don't think has anything to do with it. There is a terrific amount of un-employed plus a lot of labour trouble - strikes, etc. Just a case of bad conditions in the Country. The TV programs I've seen, would certainly drive people INTO a Theatre - even to see a bad show! They are awful! There is no Sponsorship - consequently - the cheapest thing is offered. Our new sketch turned out quite successful. It was recorded on tape during our opening week. Think you will get a kick out of it when I get back to run it for you. Of course it has greatly improved since then & may have another recording made later on. Living conditions are good, but very expensive. Weather has been good, so far a very mild Winter but Feb. & March are generally bad here. See you heard about Jimmy Finlayson passing away - Poor old Jim. We just heard from Hal Roach Sr. He wants us to make 40 TV. shorts. That's a hell of a way to start the New Year! We can stay here till next Sept. but the Australian Tax situation has been settled now & its possible we may go there in May for a six months run. I would like that for a change - am getting tired of wearing a monocle! We play London West two weeks, Empire Chiswicke & Finsbury Park. Then Brighton & back to the Provinces till April. Sheffield - Leeds - Glasgow - Edinburgh etc. Well, all for now. Eda joins in love & fond thoughts & every wish for a Happy & Prosperous '54. lots of good health & good luck. If our deal for Australia goes through will of course let you know. Please give our love & best to all the family. Thanks for your interesting letter of the 18th inst. We appreciate very much your kind invitation to pay our respects to your '17 Tourer but afraid we are unable to do so. However, we are pleased to know you are getting good service out of the "Old Faithful" plus a lot of fun & enjoyment. With kind regards & thanks for the good wishes. It certainly was nice to hear from you. So sorry to note re Mrs Cowie - am sure that must be very painful. It's strange the Drs can't figure out what is the cause - it's evidently something that the XRay doesn't pick up. I hope however they are able to relieve the ailment - maybe it could be a form of rheumatism or arthritis - it sounds like the symptoms or reaction. Am pleased to hear Anna is going along O.K. & gaining the very necessary experience. The easy comer show & Pants is good solid training & the places to FIND yourself. I read in the States about the fire at the Imperial - so it is interesting to know that it has been beautifully rebuilt & open again & also that you are back on the Job. Yes, we shall be at the Empire in Glasgow week of April 5th. & it will indeed be nice to see you again. We are doing a new sketch, which I hope will please Empire audiences. I was shocked when I heard re McKenzie Reid - we had seen him & Dorothy playing in Nottingham just two weeks before he passed away. Dorothy called us from London & told us the sad news - We were just sick about it. Poor Geo. he had been ailing for quite a while. We shall be seeing Dorothy next week - we are at the Empire Chicwick. All for now Tom. Looking forward to seeing you all again. Mrs. L. joins in kindest regards & every good wish for '54.